I’ve recently been spending a lot of time on my iPhone, and today I thought I’d share with you a rundown of my top three useful apps at the moment. 1. 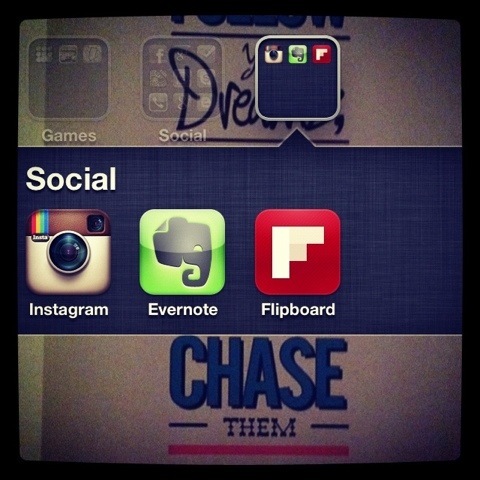 Instagram – This is the app that most of us may have heard of, and is also a personal favourite of ours. The photo sharing network allows you to take your favourite snaps, and apply them against a range of digital filters, to give them a different look; and make them look extra pretty. The app, originally released on Apple’s App store, has recently expanded into the Android market, where it hit over a 1 million Android users within 24 hours! The app does more than make your pictures look pretty too. With Instagram you can connect, and share with your friends from Facebook, Twitter, Email and Phone contacts, and basically anyone with an Instagram account. There is room to like, comment on each photo, and share with the rest of your friends on other networks. 2. Evernote – This takes notepad to a whole new level. I find Evernote is great for capturing those random pieces of information. When all I need is to record a phone number, the URL of a website, a photo, or a quote from a very long article; Evernote is a great way to capture, store and organise those random pieces of paper you have dotted around your desk, home, or car. And the best part of all is, you can access them from any smart phone, or computer. 3. Flipboard – Is an aggregation service that serves up current, and relevant information from across several social networking platforms, and websites. This is a sleek, and effective way to view social content from various places, and condense them into one. The magazine format adds to this streamline interface, which allows you to flick through your social content at your own pace. I particularly love the ability it has to re-tweet, respond and share directly to my linked profile. Although the choice of platforms are currently limited, all the main ones are there (including Facebook, Twitter, LinkedIn, Instagram, Tumblr, Google reader). It is limited to download on Apple devices only, at the moment, however; I imagine this is something they will be expanding on in the near future. The great thing about all three apps, is that they can help your business run smoother, and more effective regardless of the industry, or background you find yourself in. They are free, user-friendly, and most of all a great way to stay organised, relevant, and up-to-date with what’s going on in the sphere of social, and beyond. For anyone who says they don’t journal, I beg to differ. Over 800 billion people are active on Facebook, over 90 million users on Google+, which I imagine has taken a sharp rise since the announcement, Search Your World was made by Google, back in January; and lets not forget Twitters big news this week, as it reached its 500th million user mark on Wednesday. We may not write in our traditional leather bound journals anymore, but we are recording every day via our timeline, twitter feed, sharing, liking, following and of course our SEO friend +1’s. All of which is taking place before we create a blog; or ‘online diary’ as they are often referred too. Everything we do, like, know, smell or touch today is being documented online via our computer, tablets, and or smartphones – and it’s not just the devices either, but the social platforms we participate in. Please leave your thoughts, comments down below or hop on over to our Facebook page, and hello! Have you heard about Pinwheel yet? – The new way to find and leave notes all around the world?? I stumbled across this earlier today, and felt the burning desire to blog about it today. Pinwheel, which appears closely related to Pinterest, (and in fact has no relation) is the news venture of Caterina Fake; who is also known as one of the co-founders of photo-sharing site Flickr, which she sold to Yahoo back in 2005 for a mere £22 million. The site, which is about to open up in beta will be made available to a selected few, who will get to test drive the site across its web and mobile web platforms. Caterina invited those wishing to be first in to leave their details via a link on her blog, which you can find here. User will be able to send notes public, private, shared with an individual, in a group or with the whole world, explains Caterina. Wondering how this will create profit? Yeah, I was too. It seems that Pinwheel will take the route of sponsored notes, and inviting businesses to sponsor them. The idea is that these notes will operate as a direct mapping system, pointing customers in the direction of those stores, or indeed opening the possibility to promote products in specific locations. This is one to watch, and a timely invention given the rise in location-based marketing. One of the greatest things about my job is the people I get to meet, and interact with. Who are you connecting with today? One of the best parts social media has to offer, for me, is the ability to connect with all kinds of people, from all four corners of the earth. So today’s post is a very short, and snappy one. I’m busy working on a value project, which I hope to bring to you soon. Just to leave you with one thought. Who are you connecting with? Please remember, social media isn’t some magic formula that will automatically give you a ROI by logging on to Facebook. Social media is a tool, and a tool that has the power to connect you with your target audience. If you have any marketing questions that you’ve been thinking about for a while, or you would like more information on social media strategies then please feel free to connect with me on Twitter @leemac85.